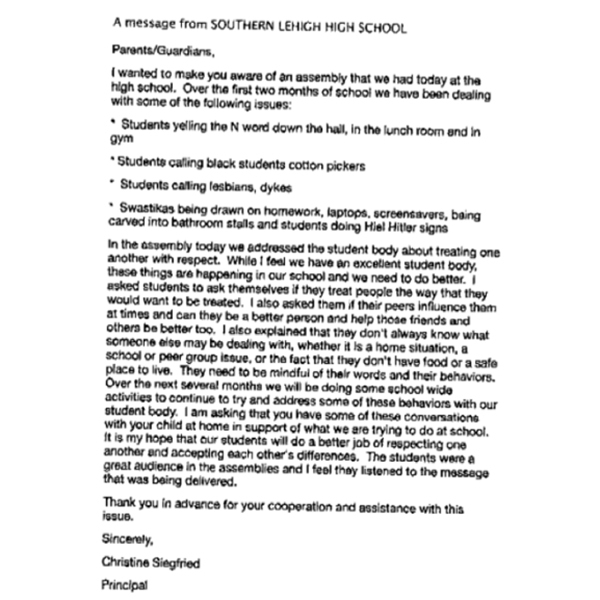 Southern Lehigh High School in Center Valley, Pennsylvania, has been battling name-calling, harassment, and racial slurs since the start of the school year. CENTER VALLEY, Pa. (WPVI) -- Shouting racists slurs down hallways, in the gym and at lunch. Calling black students cotton pickers. Swastikas are being carved into bathroom stalls, and some students are accused of giving "Heil Hitler!" signs. These incidents are reportedly happening at Southern Lehigh High School in Center Valley, Pennsylvania. It's news we had a conversation about with quite a few neighbors on Friday. A woman named Roshelle is in disbelief. "My god. I don't believe it. I'm like incredulous. I really am," said Roshelle of Springfield Township. She's lived in this area for 30 years, and says she's never heard of racism here. And it's breaking her heart. "I'm very disappointed," said Roshelle. Others we spoke with were stunned as well like Donna Solove, who's well aware of the situation. "Oh I think it's horrifying," said Solove of Center Valley. She, like many, are pointing some of the blame on the recent election. "I think it rallies up maybe students' emotions, young emotions," said Solove. Students tell us the school held an assembly last week to address the issues. "I think it's terrible. How can you say something like that to somebody? Like why even say it in the first place?" said Emily Pasceri, Southern Lehigh High School student. "They should be punished somehow," said Mike Moyer, Southern Lehigh High School student. The students we spoke with also want to reassure the people in the area they think it's a small number of students who are saying and doing these things. And they are just are disgusted by the remarks and actions as everyone else.